Earth Day is all about learning ways to protect the earth and one easy way to do that is with green cleaning. Eco-friendly cleaners are not only gentle on you and planet, but also safer than conventional cleaning products. And if you make your own, they are much cheaper, too! So, I thought I’d share with you some of my favorite go-to green cleaning recipes that help you tackle everything from scrubbing out the sink to doing the laundry. You can easily whip them up in under five minutes and they cost just pennies to make. Nothing wrong with adding a little “green” to your wallet to make the earth greener! 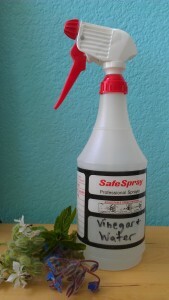 All-Purpose Aromatic Vinegar Spray. Use the power of essential oils, which have natural antifungal, antiviral, and antibacterial actions, and vinegar, which is especially great at killing germs, cutting through soap scum, and zapping mold, to make this effective spray for cleaning your bathroom, kitchen, floors, and more. I’ve found many uses for it and it’s a staple it my household, so I suggest giving it a try. Why not whip up a few bottles with different scents? I often make a lavender and tea tree combo, which is absolutely great smelling and great at disinfecting as well! Peppermint is a second favorite of mine. Aromatherapy Cleanser. Make scrubbing out the sink and cleaning the bathroom tile much more pleasant with super easy to make cleanser, which uses two simple ingredients — baking soda and essential oils. Eco-Friendly Lavender Citrus Linen Wash. Turn hand washing from a chore into a pleasure with this aromatic, all-natural linen wash with a lively scent. Use it for hand washing your most delicate items or even as a laundry detergent. Lavender Rug & Carpet Freshener. Pet odors, crushed food, spilled sippy cups….If you can think of it, it’s probably in your carpet! Instead of using toxic, conventional carpet cleaners, why not try your hand at making this natural carpet and rug deodorizer? You simply sprinkle it on, forget about it for a good while (to let the baking soda get to work absorbing odors), and then vacuum it up. What could be easier? Lovin’ Laundry Lavender Vinegar Rinse. Love doing your laundry again with this fantastic rinse made with lavender essential oils and vinegar. It will remove any remaining traces of detergent, deodorize, and act as a natural fabric softener. Plus, the lavender, which has antiseptic, antiviral, bactericidal, and fungicidal actions, will lend a lovely scent to your laundry! ← Pep Up Your Health Naturally With Peppermint!